Preheat the oven to 375. Line a 9-inch tart pan with the dough of your choice. Peel, core, and thinly slice the apples, and fill the tart shell with them. They will sink during cooking, so don’t feel apprehensive if the bottom is piled high. Mix the remaining ingredients together quickly with your fingertips and pour them over the top, flattening it evenly by hand. cook for 35 -40 mins: a skewer will tell you if the apples are cooked through, and the top should be beautifully browned. Serve with crème fraîche, clotted, or crème crue. What is a nibbed almond? Where can I get vanilla sugar? These ingredients perplexed me for a moment. Then I decided that nibbed almond must be ground blanched almonds. Vanilla sugar appears on no grocery shelf I searched. So, I substituted 1 tsp. of good vanilla extract. Toss in a lemon to the list of ingredients and that’s what I began to work with. I used Dorrie Greenspan’s delicious all-purpose pie dough, which I’ll offer in an upcoming entry when I can devote all my attention to praising her book. Once I rolled out the dough, lined the pie tart with it, and stuck it back into the fridge to chill for an hour, I turned to the apples. I used Gala apples. After coring, peeling, and slicing them, I put them in a bowl and sprinkled lemon juice over them. I heaped all the apples in the chilling pie tart and sprinkled the teaspoon of vanilla extract over the apples, an utterly inadequate method, I know, of delivering the vanilla, but next time I’ll figure something else out. (any suggestions?) I continued to let the pie chill. I mixed together the flour, butter, ground almonds,and pinch of cinnamon. I thought there was a touch too much flour. I might adjust that amount downwards next time. 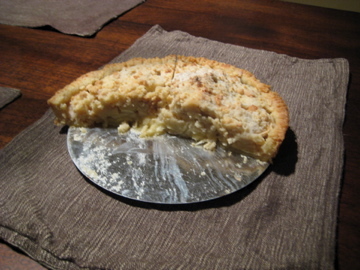 When I was ready to cook the tart and had heated the oven, I heaped the flour/butter/almond mixture on top of the apples. Into the oven. I waited until the top had browned, which took longer than 40 mins. After removing it, I let it sit for 5 mins or so before serving. The tart seemed a bit dry to me, but the flavors were very good. It needs a good buttery crust. Next time, I think I may add calvados. Rhubarb, perhaps? In any case, like so many other recipes in Day-Lewis’s book, the recipe offers a lot of opportunity for experimentation. To tell you the truth, I’m not sure. Let me ask a few others. Meanwhile, I think you can click on the “Notify me of new posts via email.” at the bottom of this page. Thanks for asking.